Anytime we’ve worked on a new film with our buddy Danny Macaskill I normally spend the night before thinking over the film, nervous or apprehensive of how it’ll be received. The films are always anticipated and with who knows how many million people viewing the last ones we made it comes with a certain pressure to match up. Somehow though this time is different, after a wild summer of production I’m now sat by a pool on a long awaited holiday and feeling chilled about the whole thing, it’s a long story to explain why but maybe it comes down to the fact that I feel like we’ve come back again with something different, put all our ability and energy into it and in reality what more can you do… I’m basically just really stoked on Danny’s Wee Day Out (apart from one shot….but there’s always that ‘one shot’). So….what could we actually do that is new?.. Well as usual it begins with a constant flow of conversation and texts with Danny and his thoughts on new riding and tricks. It essentially always begins with Danny’s incredible talent on a bike and mindset for coming up with tricks and then builds from there. What initially came out was his desire to ride the mountain bike and perhaps something that based around trail riding… One thing we felt we learned from The Ridge was how people responded to the barbed wire fence at the end, not just the scary trick itself but we always believed that it worked particularly well because everyone can relate to it, we have all leaned on/climbed over a fence like that so the impressiveness of the trick is multiplied by the fact that we can all fully relate to how impressive and hard it is. 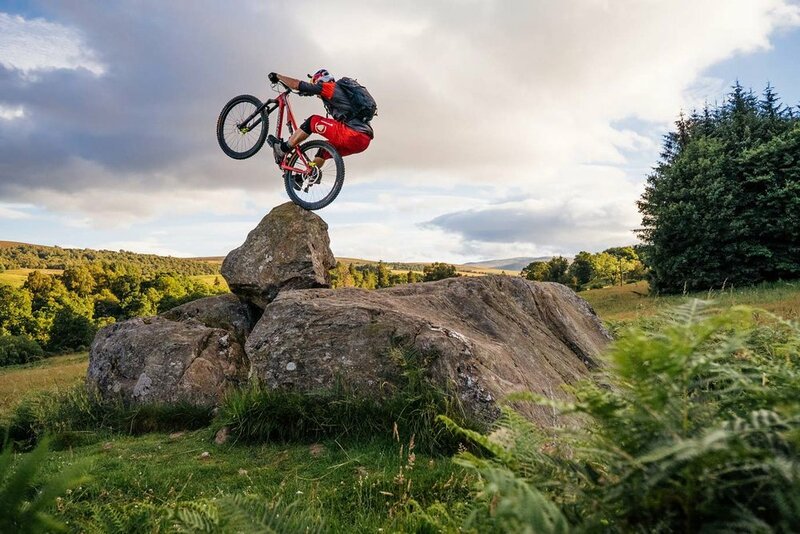 So from that we came to the idea of Danny riding a mountain bike but then make it specifically relatable by basing the film around a fairly standard mtb ride somewhere… The actual initial working title of the project was ‘Wild in the Woods’ as that was the very first thoughts around Danny’s riding ideas; Danny riding an MTB trail in the woods but interpreting obstacles, nature and surroundings in a different way. From that point our development process took it further on though; away from just one trail and more towards being based around a fun day out in the British countryside but the beginnings were always about Danny wanting to bring some creative new tricks and our focus of wanting to make it relatable to everyone viewing the film. When it comes to this type of project Red Bull UK are an awesome client, they completely understand what goes into the process of a film with Danny and the time it takes to develop. After Danny sketching out some ideas for tricks at the beginning and without too much more of a plan we all seemed to agree it just needed a big stretch of location scouting, so our scout Nash headed on a trip round Scotland on the look out for some interesting spots that might work for the tricks… Over a couple of months we began pinning down some potentials and although it is a constant evolving creative beast when it comes to working with Danny we got ourselves in a position where we could see a few lines emerging that would suit the tricks he had in mind. From my ‘directors hat’ point of view the filming style and look was always a point for discussion. Initially we talked over going towards a bit more old skool handheld look to the film similar to some mountain bike films from the late 90’s/00’s which I love (Sprung video’s anyone?). Danny was always really into this as again it seemed like a good way to give the film a different, distinctive look to any of his previous work. As the scouting progressed though two things became clear for me; one was that tons of the locations weren’t in the ‘woods’ and each had distinctively different looks so the one trail theme wasn’t going to work (continuity was a nightmare in this edit!!) and secondly although it was super creative, the riding that Danny was sketching out was often quite slow movement so wasn’t going to suit any fast ‘pans ‘n’ zooms’ type shooting. From the locations and tricks ideas that had appeared I became really into the old British film feel (I’m old enough to have Chitty Chitty Bang Bang (this) and Mary Poppins as my childhood viewing so it began with that :)) and with the backdrop of rolling green hills, combined with the humour that could be injected through the new tricks Danny was suggesting all mixed together and taking some traditional British “Carry On’ film vibes I thought it could work well. The filming style of this would be more of a beautiful cinematic look than the classic handheld ‘pans n’ zooms’ style originally planned, this would aim to capture the essence of some of those old movies and we’d also add to this through the music, edit and colour grade… One point to also note is that from my perspective nowadays Danny is also way more comfortable injecting some humour and personality to the scenes now too, he’s definitely a crazy talented bike rider first and foremost, but now we’ve definitely taken a pinch of the entertainment factor too and he’s cool with that (I remember it being a bit trickier to persuade him in Imaginate! ), it’s a fine line but from the outset we felt that if the riding was completely credible we could push the humour and cheese factor further… Anyways, we started throwing round that idea a bit more, it is a journey feel which we had done a lot of before but it felt fun and when combined with some new inventive riding and plenty of character it definitely felt fresh enough that it could work… Basically from the beginning in reality we just wanted to make you all smile with fun and bike riding! At that point the track ‘National Express’ by the Divine Comedy then entered the equation. Most in the UK will know the song and once we started chatting on the old British feel and the almost cabaret feel to this track it immediately became a reference point. Danny had had it on a playlist early on but weirdly at the start though we didn’t plan for it as the main song, just a strong reference while searching through music. By default we seem to always seek out new music that people won’t know for the films but after a while it just seem to work better than anything for the concept and in hindsight I like the different approach of, for once, using a song so many would recognise but not have heard in years! Filming on this project took FOREVER! It was generally a small team but there were a lot of filming days….the tricks and riding could be new to Danny so often took a lot of learning and a few gave him a rough time! I can’t begin to stress how hard some of what Danny does in this film is. It may not have the extreme location or danger such as The Ridge or Cascadia but technically for Danny it was completely new ground and so difficult for him to pull off. From a production side this is near impossible to plan for, with so many new ideas and ‘world first’ tricks you have no idea how long each trick will take to film/land, scheduling between our other clients and Danny’s crazy schedule is tough so we ended up with a core team working on the project of myself and Andre (Andy Ashworth) filming, Davey Mac either camera assisting or on stills, Nash on the build and more often than not John Bailey from Vision Ramps helping too. On top of that we’d have a list of others who could come in as and when it worked for both parties. I remember the log slide being some of the toughest shooting days. It took Danny 3 full days of trying to land and it was in a period in the middle of the summer when the film hadn’t quite taken shape. Early filming had been more standard ‘Danny’ riding that he’s done before; the trials line over the bridge and hut, the opening line at the train station, the nose wheelie on the bridge and one line that didn’t make the edit in the end. All really impressive stuff but at that point we didn’t have either the character or the more creative riding so it was a constant concern for me that the film wasn’t setting itself apart enough. Both Myself, Danny and everyone else involved set the bar so high for ourselves that even with Danny doing the most amazing riding you still have to be able to stand back and see if from a film/concept side it is up at the level we were striving for. With the log slide Danny had literally no idea if he could land it and went through all levels of emotion over those 3 days. We’d stand there in this muddy field literally willing him on every time and doing what we can. Danny’s determination in those situations is unreal, what makes his so good as a rider and a creative is that he wants it in the film as much as any of us and will put is body through a heck of a beating just to do it… It was a huge moment (and to be honest relief) when he landed it and definitely allowed us to kick on and let the film begin to take shape. 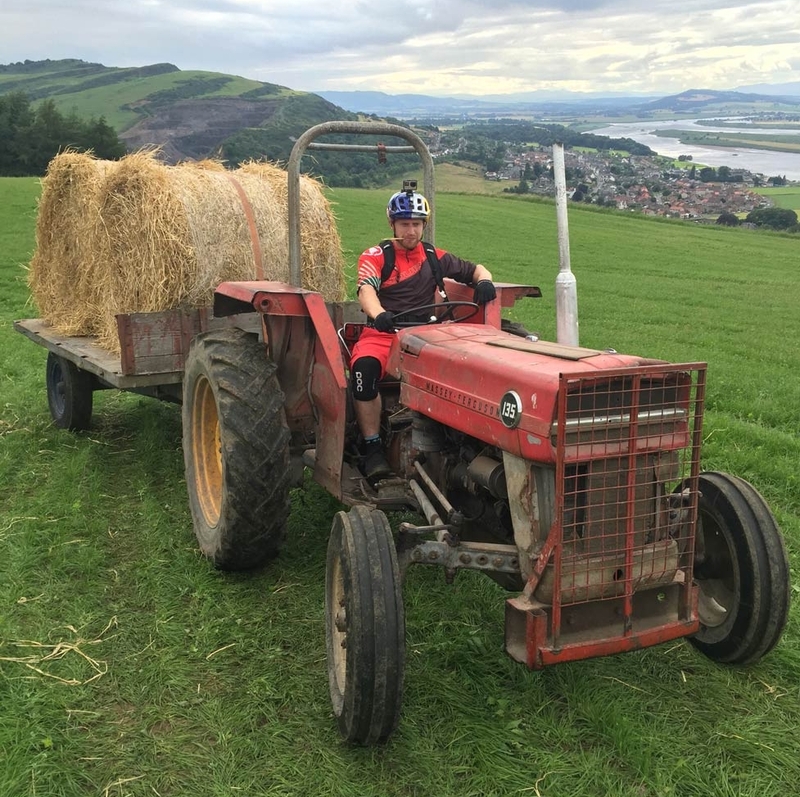 The Haybale took a lot of attempts for Danny. It was arguably worse for the boys who had to push it back up the hill every time though!! About 2/3rds of the way through the 4 month period of on/off filming we shot the puddle sequence, after that I think we knew it was coming together and was going to work out. Personally the last few days of filming were the best, the final train station scene was awesome and then the last thing we filmed was the backwards roll. The start of filming is always scary, the middle period is stressful as the film finds it’s look/feel and then the home straight is always awesome. I’d love adding a narrative element where possible and having Danny’s Mum Anne involved in Imaginate was awesome so I’d mentioned early on that I keen to create a link from this and have his Dad Peter in this film! The backwards roll had been another trick that Danny had called out very early in the process, it was constantly discussed but as much as myself and others will encourage and talk over what will work in the film, at the end of the day it’s Danny who takes the risks and has the skills and vision to determine what is possible and he was never sure if he could do it. He tried it several times throughout the shoot and couldn’t quite figure it out (I’m sure some hilarious initial attempts will surface sometime). It was so awesome to see him pull that on the last day of filming and another great example of his drive when it comes to shooting these films, I’ve never seen anyone come close to his determination to make awesome video. This guy! One of the biggest unsung heroes of our work and most all round talented dudes. Davey Mac; photographer, filmer, set designer, lover. There are tons of people to thank for putting a crazy amount of effort into this film: Danny for putting himself through it all yet again and being the most phenomenal bike rider and collaborator, all the regular crew who grafted over the months Andre, Davey Mac, Nash and John. Katie for somehow being able to efficiently manage and co-ordinate the whole thing (like trying to herd cats with an airhorn at times! ), Gav Livingstone for his incredible skills and effort on post production (we managed a 9am – 5am shift last Friday to finish it off), Jonny Ashworth for all the BTS graft, Scott Marshall for killing it on the train station shooting (and dealing with my stress! ), every one of the team at Cut Media who have kept the wheels on the truck the last few months, our Exec Producer Jim for all the support and always just letting us do our thing, all the locations, anyone who worked on the shoot, Red Bull UK and everyone else I’ve forgotten! There is a lot of negativity in the media these days… I hope the film gives you a wee break and makes you smile!